The Microsoft Lumia 640 is the affordable flagship model of Microsoft but with the launch of new Microsoft Lumia phones, the price of the handset got lowered quickly. 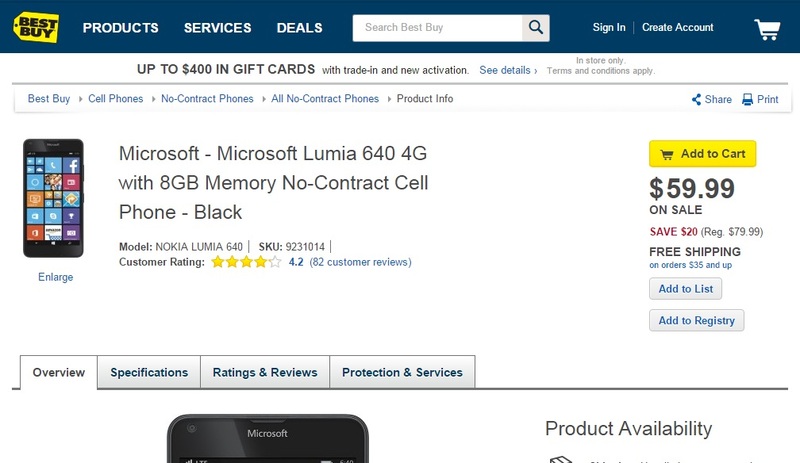 And now Best Buy is offering Microsoft Lumia 640 for AT&T at a price of $59.99 only. This pricing is for the non-contract price for the phone and its compatible with AT&T’s GO Phone prepaid wireless service. Featuring a 5 inch HD display the Lumia 640 is powered with Quad core processor with Snapdragon 400 SoC and 1 Gigs of RAM. The smartphone is planned to receive the Windows 10 update in November. We are not sure how long this deal will run at Best Buy but if phone OS doesn’t matter to you then definitely this deal is worth a go.